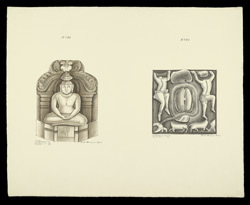 Wash drawing of two sculptures, from an album of 42 sheets (89 drawings) depicting sculpture from Amaravati and S. India. Inscribed with numbers 2 to 90 (1 is missing) and with measurements; signed:' P. Mooroogasa Moodr'. 1851 and 1852 water-marks. The drawing No.81 depicts a figure of seated Jaina and No. 82 represents a memorial stone from South India now held in the Governement Museum of Chennai, labelled 'provenience unknown'. India has a very ancient tradition of erection of memorial stones. These have various local names, viragals, hero-stones, being one of them. The establishment of memorial stones normally followed the death of a hero in a battle and was related to political, social, economic and religious casues.